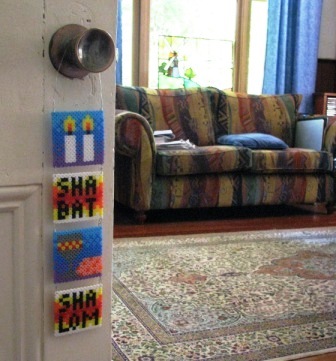 2 Responses to "Jewish patterns for fuse beads – Shabbat"
part of my delay in scheduling a fuse-bead session was the thought of yet more stuff to stack up on a table, get knocked to the floor, etc. But the stringing on a doorknob idea is perfect. Thanks for the patterns and the idea.